Intact family – all children are the biological and/or adopted children of both married spouse or of both common-law partners’. Simple stepfamily – a couple family in which all children are biological or adopted children of one, and only one, married spouse or common-law partner whose birth or adoption preceded the current relationship. Complex stepfamily – any of the following: a family in which there is at least one child of both parents and at least one child of only one parent; a family in which there is at least one child of each parent; and/or a family in which there is at least one child of both parents and at least one child of each parent. Source: CICH graphic created using data adapted from Statistics Canada, 2012. Families and Households Highlight Tables. 2011 Census. Statistics Canada Catalogue no. 98-312-XWE2011002. http://www12.statcan.gc.ca/census-recensement/2011/dp-pd/hlt-fst/fam/index-eng.cfm?Lang=E -accessed March 19, 2017. In 2011, there were 464,335 stepfamilies in Canada. They accounted for 12.6% of all couple families with children aged 24 and under. In Québec, 16.1% of all couple families were stepfamilies, as was the case for 15.8% in the Yukon and 15.3% in the Northwest Territories. In Ontario stepfamilies account for only 11% of all couple families. Stepfamilies – or blended families – take many forms in Canada today. There were 271,925 “simple” stepfamilies in Canada in 2011 – accounting for 59% of all stepfamilies. 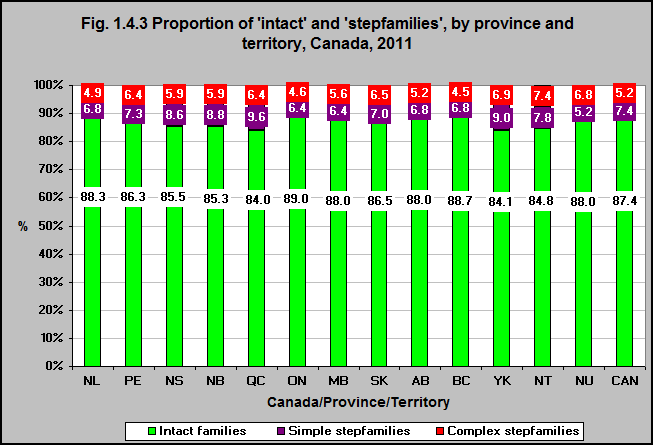 In 2011, there were 192,410 “complex” stepfamilies in Canada – accounting for 41% of all stepfamilies.